It happens. It is the way it is supposed to happen. I am her son, always. Our human lives are physical/emotional, everything else is an abstraction (unless you are from some sort of lizard species). Looking through some photos today, I decided I liked this one for my blog (originally posted in Sept 28, 2009). 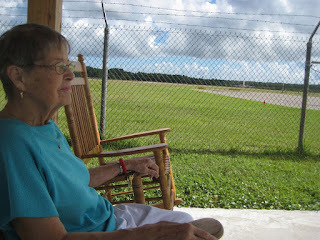 The subtlety in this pic (looking very closely) is that in my Mom's gaze is an aviation NAVAID "the white thing" usually invisible when flying. I have faith. The same faith you feel when your foot hits the floor getting out of bed or when you make a turn in traffic. I will grow my faith. I will drive and pull as I did as they all did as they prayed for my survival when I was born. God bless us all. Throughout my life I was reminded from strangers that MY Mom was a genuine caring healthcare provider. She sincerely touched thousands of lives in Western, NY. They may not remember her name. They will somehow remember her care. Today, it seems these days are very far gone. My Mom brought her tough days at work home with her. Sometimes she brought the traces of blood and vomit on her uniform. If your Mom or loved one died that day, my family felt it. I never met you. I feel for you and your suffering. It is something we carry with our everyday dishes and silverware. I still use those plates and silverware. Her obituary is short and forthcoming. I love you all. Sorry for your loss Charlie!